Blondie Bar is a lovely small bar and restaurant, nestled into the Melbourne Recital Centre, serving Asian inspired food. I found myself there at 5pm recently after a chamber music concert. Not quite dinner time, but I was ready for a drink and a small snack. Fortunately, in addition to serving lunch and dinner, they also have a decent bar snacks menu. What was an unexpected surprise and pleasure is that the menu contains three marked vegan options and a couple of more easily veganizable vegetarian ones. We chose a grilled zucchini salad and some edamame. 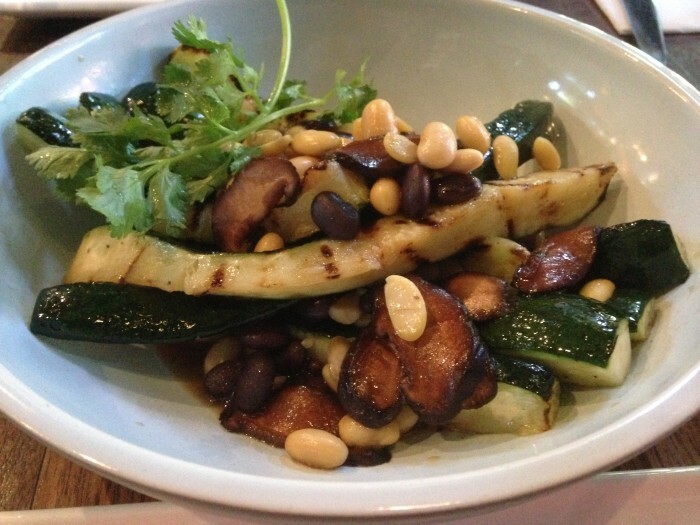 The salad was a delicious combination of grilled zucchini, white and black shelled beans and grilled mushrooms in a soy dressing. The edamame don’t need any elaboration, just the usual soybeans steamed with salt. It is always nice to know that there is another good place for a post concert snack and drink in the arts precinct. I love that place! But I’ve only ever eaten nuts and dumplings there. Will have to go for a meal next time.